Probably the most colorful desktop i ever got LoL, but still easy under the eyes. 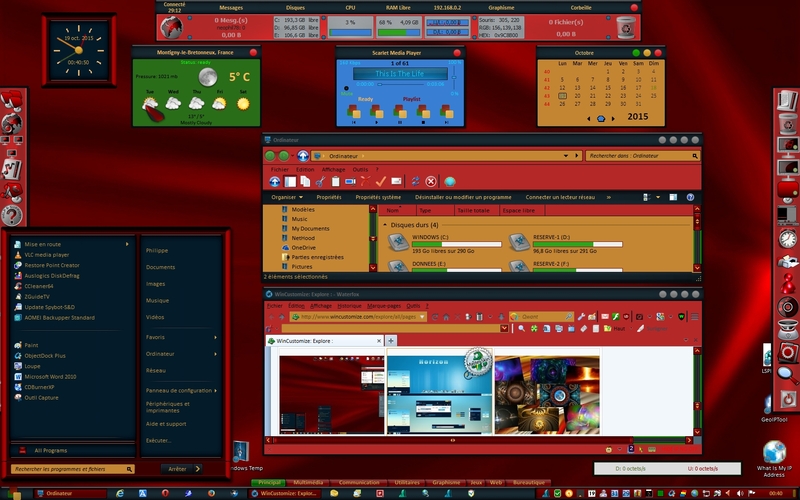 Coming with Scarlet WindowBlinds by LightStar Link (with a few tweakings in it). PNG's used in docks backgrounds are a melting pot of different IconPackages, as well as the ones for building the IconPackage itself. Sysmetrix, Rainy, Clock, Weather & Media Player Widgets by me, wanting to play with the whole colors of Scarlet & Startmenu panel image as well . Firefox / Waterfox used with Classic Theme Restorer ( Link ) which allow them to be correctly skined directly with WindowBlinds.